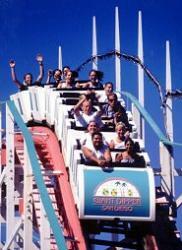 The Giant Dipper is a popular ride at Belmont Park. The Belmont Park rollercoaster in San Diego, the Giant Dipper, is one of the most beloved and famous coasters in the world. It has delivered millions of rides to enthusiastic riders for more than 80 years, and today it is one of the most recognizable and popular coasters of all time. The Giant Dipper is a small wooden roller coaster with a big attitude. While the coaster stands a mere 75 feet tall (small by modern standards), its twisted track with sharp curves, heavily banked turns, and steep drops delivers excitement throughout its 2,600 foot length. The top speed is 55 miles per hour, and riders are treated to a wide range of G-forces that thrust them from side to side as well as lifting out of their seats during the one minute, 45 second ride. Because of the coaster's abrupt changes of direction and the signature "rickety" feeling of the ride, riders must be at least 50 inches tall to ride, and all safety restraints must fasten securely. The Belmont Park rollercoaster is one of only two seaside coasters remaining at theme parks in California; the other ride - also called the Giant Dipper, which was a popular name decades ago - is located at the Santa Cruz Beach Boardwalk park just south of San Francisco. Because of its popularity, modern appeal, and vintage design, the Belmont Park Giant Dipper is a designated National Historic Landmark and a fun piece of California and roller coaster history. The Giant Dipper first opened on July 4, 1925 with great fanfare. While the ride was popular, as economic times toughened during the Great Depression, the park fell into disrepair and the future of Belmont Park and its roller coaster was uncertain. The park and ride both survived until the mid-1970s, when both closed. Through the late 1970s and 1980s, the Giant Dipper was standing but not operating (SBNO), and though it survived several amusement park fires and general disrepair, its future was uncertain. Once a demolition date for the coaster was set in the late 1980s, a group of concerned citizens and roller coaster fans established the Save the Coaster Committee to preserve the Giant Dipper. While their efforts were not able to raise the money necessary to restore the coaster, they did succeed in drawing attention to the ride's condition and interesting developers in its restoration. In 1990, the Giant Dipper reopened with updated safety equipment and began a renewed love affair with the citizens of San Diego. The original cost of the coaster was just $150,000 and it was constructed in two months. The restoration cost more than $2 million and took several months, but the ride's popularity has skyrocketed and its landmark status ensures that it will be a fun attraction for many future generations. The Giant Dipper has celebrated many occasions and seen a lot of history, including several noteworthy events that have rejoiced in its restoration. In 1997, local radio station Star 100.7 staged a coaster riding marathon, "Whirl Til You Hurl." After eleven days of riding the coaster for more than 12 hours a day, three winners each received a new car. The radio station arranged a second marathon in 1999, which was eventually won by five contestants who split a $50,000 cash prize after riding the coaster for 70 days. The Giant Dipper has also celebrated many birthdays, and its 75th birthday in 2000 was greeted with even more fanfare than its initial opening in 1925. Free cake was given to park guests, clowns offered entertainment for all ages, and balloons decorated not only the midway but the coaster itself. For that special day, coaster rides were just 75 cents. Liberty Carousel: This antique reproduction carousel creates a thrilling scene of California history that all ages can enjoy. Chaos: Riders on this crazy contraption spin in three dimensions with rotating cars that lift into the air and spin along a central arm. Tilt-a-Whirl: This classic carnival ride is fun for all ages. FlowRider: Guests can mimic the choicest surfing waves on this live simulator. The Plunge: Anyone can dive into the fun at San Diego's largest indoor heated pool. Other attractions at Belmont Park include a pirate-themed miniature golf course, large arcade, wild west photos, bumper cars, and other fun things to try. After working up an appetite, guests can sample Chinese food, wings, ice cream, cotton candy, grill items, and other treats. For even more fun, Belmont Park is available for birthday parties and other special occasions. Belmont Park is open throughout the year but hours can vary seasonally on different rides and attractions. Tickets are $23 for an all-rides daily wristband, though guests can take advantage of discounts by buying tickets online. Single ride tickets for the Giant Dipper are $6. For more information about the Belmont Park rollercoaster and the other attractions available at this San Diego park, visit the official websites, BelmontPark.com.